LAFAYETTE, Ind. — Join the Lafayette Ski & Snowboard Club for good food and companionship at their annual kickoff party on Thursday, August 25th from 7:00p-9:00p at Monical’s Pizza (3500 SR 38E) in Lafayette. The 2011-2012 Winter trip schedule will be announced. Bring your checkbook to pay for membership and make down payments on trips. Also, bring your appetite. We are a not-for-profit, volunteer community organization based in the greater Lafayette area thats offer its members the opportunity to ski with others of similar interest and ability levels. (We have everything from non-skiers to expert). We help provide the best skiing to the most people at great prices every winter. In addition to formal events, some of our members take informal, small group trips to locations in the Midwest and elsewhere. If you enjoy skiing and would like to share and/or gather information about it, our group is for you. We do all of the planning and organizing of our events with volunteer chairpersons. Volunteers publish our monthly newsletter The First Run to keep members informed. All you have to do is show up! On the other hand, you can get as involved as you want. Plan an event. Run a trip. Be a chairperson or committee member. Serve as an officer or board member. Getting involved is easy, and the rewards are great. Our club usually takes two ski trips to the western United States each year. Locations vary, but trip costs include transportation, lodging, lift tickets, and a group pizza party. Because our trips are package deals that planned months in advance with enough participants to qualify for group rate discounts, we get very competitive prices. Western trips—including those this winter–usually occur during Martin Luther King week and Purdue Spring Break week. 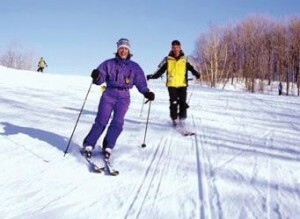 Each trip offers at least 4 days of skiing. In addition to our western trips, we also offer a learn-to-ski day bus trip to Swiss Valley Ski Resort in Michigan in February that includes charter bus transportation, movies/snacks on the bus, lift tickets, equipment rental, and a complimentary lesson if needed. It is a great way to both beat cabin fever and learn how to ski for ages 4 and up. We may also offer a weekend carpool trip to Boyne, MI—we stay at the Toledo Ski Club cabin while we are there for a very low rate–depending upon demand for participation. Our kickoff party will be held on Thursday, August 25, at Monical’s Pizza in Lafayette at 7:00 PM. It is recommended that you bring a checkbook in the event you’d like to become a member and join us on our trips. Monthly meetings (except summer) are held at Monical’s on the first Wednesday of the month at 7:00 PM.